There are many ways to control insects safely without harming plants or animals. The use of other plants and insects is one way to help control these pests. The best pet-friendly pesticides are organic homemade sprays. As a last resort you can use pesticides that are partially pet-safe. Herbicides, pesticide sprays and granules are often necessary to keep gardens healthy, but, if consumed by pets, they can be lethal. 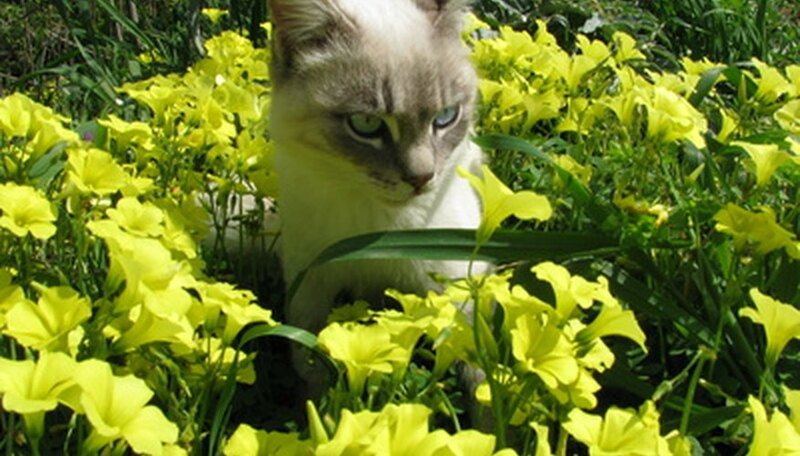 There are trap plants that are beneficial in luring insects away from crops but are pet-safe. Trap plants can be grown between crops and are more attractive to insects than the crops. You must watch these plants and destroy them once the pests begin to build up. Beneficial trap plants are marigolds, garlic, dandelions and basil. Three insects that work as insecticides but are not harmful to pets are the aphid midge, lady beetles and the parasite wasp. Aphid midges are about 1/16th inch in size and have long clear wings and long legs. Aphid midge larva feed on most species of aphids that destroy plants. Lady beetles also feed on aphids, insect eggs and small, soft-bodied insects. The lady beetles, commonly known as ladybugs, are orange or red with black spots. You can attract lady beetles by spraying sugar water on plants. The parasite wasp is effective for destroying insects by laying their eggs inside plant destroying insects. They will not attack humans or animals, only insects. Homemade sprays work efficiently as insecticides, but are pet-safe. Water, sprayed forcefully on plants, will knock the bugs temporarily off the plant. This must be done at least twice a week. The bugs will eventually crawl back on the plants. However, the mouth-parts of the aphids will have been injured by being sprayed off the plant and they no longer will be able to eat the leaves of the plant. Kaolin is a product that contains a China clay, which is mixed with water and sprayed on plants. Plants must be completely covered in order to protect the plant. When the clay dries, the plants will have a thin, white powder on them, which stops insects from eating the plant. Soaps can be used to control aphids, mites and caterpillars. Soap only kills on contact, so, once it dries, it no longer affects insects. You can purchase commercial soaps or make your own. To make your own, put one or two tablespoons of soap in a gallon of water and spray the plants. Petroleum-based oils can be sprayed on plants and smother the insects and eggs. Only eggs and insects that come in contact with the oil are affected. Vegetable oils, such as canola or jojoba oils, can be used in place of petroleum-based oils. Vegetable oils seemed to work better on white flies and help prevent some types of fungus from forming. For homemade oil sprays, mix one cup oil with one tablespoon liquid soap. Mix well. Add one tablespoon of mixture to one quart of water and then spray on plants. Commercial products containing garlic and strong smelling herbs such as thyme or mint also work on pests, but are safe for pets. Carefully read the label on the bottle to make sure they have used mint oil and not pennyroyal oil. Pennyroyal oil is harmful to plants and animals; it can cause liver and uterine problems in pets. Neem oil is made from a subtropical tree. It has been used for many years as an insecticide because it has a low toxicity to pets. Neem oil repels insects and affects their development. This oil should be used as a last resort due to its possible toxicity to pets. Pyrethrins are active compounds taken from pyrethrum daisies. These are moderately toxic to people and animals. They not only kill plant-destroying insects they also kill beneficial insects.